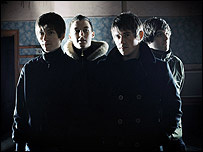 The Arctic Monkeys sold 85,000 copies of their new album on its first day in shops, putting it on course to be the year's fastest-selling new release. Music chain HMV said Favourite Worst Nightmare outsold the rest of the top 20 albums combined on Monday. The album is likely to surpass the 151,000 one-week sales recorded by the Kaiser Chiefs in February, HMV said. But it will not match the first Arctic Monkeys album, which sold 360,000 copies in its first week last year. That included 118,501 on day one alone and sent the rock band's debut, Whatever People Say I Am, That's What I'm Not, into the record books. HMV spokesman Gennaro Castaldo said: "It was always going to be next to impossible to match or beat the phenomenal day-one sales of Whatever People Say I Am... which proved to be one of the media stories of 2006. "But coming this close is a fantastic result, which underlines the band's status as the UK's number rock act. "People are buying this album not because of any media hype, but because it's had great reviews and they can't wait to hear it." On Monday, Stephen Lynn of Virgin Retail said Favourite Worst Nightmare was selling "fantastically well". It was outselling nearest rival Avril Lavigne's The Best Damn Thing by almost 10 to one, he said. "We don't think it will sell as many copies in the first week as a whole as the last album did, but we do think it will sell eight or nine times more copies than whoever is number two this Sunday." The Sheffield band built up a substantial fanbase before signing to Domino Records in June 2005 and scoring their debut number one single four months later. The first single from their second album, Brianstorm, jumped from 11 to number two on Sunday.